I had put off reading Red Queen for over a year. In the beginning, it’s just because I forgot about it, and then the mixed reviews started rolling in and no matter how hard I tried to avoid them, I still caught a glimpse of people’s thoughts or star ratings. I honestly wasn’t going to pick this up any time soon, until Joan asked if anyone wanted to buddy read it with her. I jumped at the chance because I needed motivation, and 48 hours after the buddy read started, here we are. It’s easy to see why Red Queen has gotten so much hype. There’s something about it that captivates you and doesn’t let you go. You could say that there’s a spark. *chuckles* I was hooked from the beginning, but my true devotion came about at around two thirds of the way through. It’s a wild ride and I loved every minute of it. 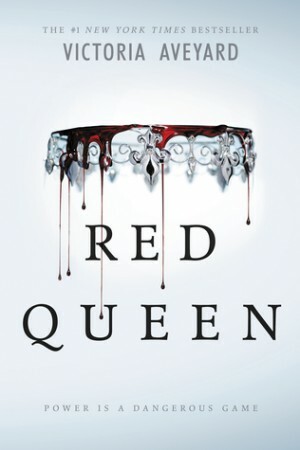 Red Queen is promoted as a YA X-Men in a fantasy world, and that’s exactly what I feel this book is. While the setting does feel a bit dystopian, considering there’s an elite and somewhat evil group of people who form the government, I would say the world is a light fantasy. And then, of course, there are the powers. The Silvers – the elite and upper class – have silver blood and powers alongside it. All different powers. People who can control metal, who can manipulate people’s thoughts, who can turn invisible… and then there are of course the classic elemental powers like Water-bending and Fire-bending. They’re not called that, of course, but whatever. Mare, the main protagonist, is a Red. A member of the working class, who could almost be considered slaves except they’re being paid minuscule amounts for what they do. Reds don’t have powers, and that’s why they’re oppressed. And this book is all about the uprising and rebellion of these people, as they fight to be treated as equals. Anyone who knows me knows that I am a complete and utter sucker for rebellion stories. It started with Spartacus and has carried on through the years. So when I realised what this book was I practically jumped for joy. I loved Mare. A lot. She’s snarky, impatient, quick on her feet, and she loves her three brothers and her little sister. Who does that sound like, hmmm? Mare is also young and somewhat naive, especially as she has been thrown into a world where nobody can really help her. There are hints of a love triangle in Red Queen but to be perfectly honest, it’s nothing to worry about. At all. Like, I am hesitant to even call it a love triangle. Can I just say, though, that I LOVE THE MAIN SHIP I AM WEAK FOR THIS ZUTARA REALNESS. And that’s all I’m going to say about the romance because of reasons. I feel like this review started off so well and now I have no idea how to carry on. It’s been almost 24 hours since I finished Red Queen and I’m still having feelings. It doesn’t help that I started Glass Sword right away, either. READ THE BOOK. Read it. R E A D T H E B O O K. I don’t know how else to put it.